New Chandra observations give the best information yet on why such neutron stars, called millisecond pulsars, are rotating so fast. The key, as in real estate, is location, location, location – in this case the crowded confines of the globular star cluster 47 Tucanae, where stars are less than a tenth of a light year apart. Almost two dozen millisecond pulsars are located there. This large sample is a bonanza for astronomers seeking to test theories for the origin of millisecond pulsars, and increases the chances that they will find a critical transitional object such 47 Tuc W.
47 Tuc W stands out from the crowd because it produces more high-energy X-rays than the others. This anomaly points to a different origin of the X-rays, namely a shock wave due to a collision between matter flowing from a companion star and particles racing away from the pulsar at near the speed of light. Regular variations in the optical and X-ray light corresponding to the orbital period of the stars support this interpretation. A team of astronomers from the Harvard-Smithsonian Center for Astrophysics in Cambridge, MA pointed out that the X-ray signature and variability of the light from 47 Tuc W are nearly identical to those observed from an X-ray binary source known as J1808. They suggest that these similarities between a known millisecond pulsar and a known X-ray binary provide the long-sought link between these types of objects. In theory, the first step toward producing a millisecond pulsar is the formation of a neutron star when a massive star goes supernova. If the neutron star is in a globular cluster, it will perform an erratic dance around the center of the cluster, picking up a companion star which it may later swap for another. As on a crowded dance floor, the congestion in a globular cluster can cause the neutron star to move closer to its companion, or to swap partners to form an even tighter pair. When the pairing becomes close enough, the neutron star begins to pull matter away from its partner. As matter falls onto the neutron star, it gives off X-rays. An X-ray binary system has been formed, and the neutron star has made the crucial second step toward becoming a millisecond pulsar. The matter falling onto the neutron star slowly spins it up, in the same way that a child’s carousel can be spun up by pushing it every time it comes around. After 10 to 100 million years of pushing, the neutron star is rotating once every few milliseconds. Finally, due to the rapid rotation of the neutron star, or the evolution of the companion, the infall of matter stops, the X-ray emission declines, and the neutron star emerges as a radio-emitting millisecond pulsar. It is likely that the companion star in 47 Tuc W – a normal star with a mass greater than about an eighth that of the Sun – is a new partner, rather than the companion that spun up the pulsar. The new partner, acquired fairly recently in an exchange that ejected the previous companion, is trying to dump on the already spun-up pulsar, creating the observed shock wave. 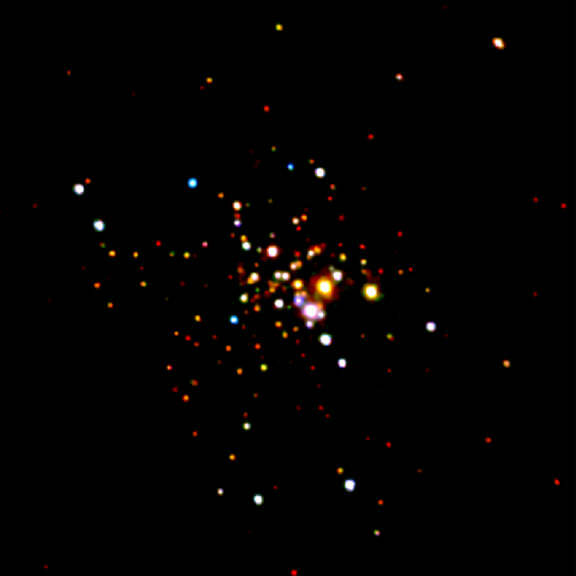 In contrast, the X-ray binary J1808 is not in a globular cluster, and is very likely making do with its original companion, which has been depleted to a brown dwarf size with a mass less than 5% that of the Sun. Most astronomers accept the binary spin-up scenario for creating millisecond pulsars because they have observed neutron stars speeding up in X-ray binary systems, and almost all radio millisecond pulsars are observed to be in binary systems. Until now, definitive proof has been lacking, because very little is known about transitional objects between the second and final steps. That is why 47 Tuc W is hot. It links a millisecond pulsar with many of the properties of an X-ray binary, to J1808, an X-ray binary that behaves in many ways like a millisecond pulsar, thus providing a strong chain of evidence to support the theory.